The global pyrogen testing market is expanding at a steady pace due to increase in implementation of strict regulations for the manufacture of pharmaceutical and medical device products, rise in number of pharmaceutical and biotechnology companies, and shift in focus of the population toward treatment of chronic and lifestyle diseases. 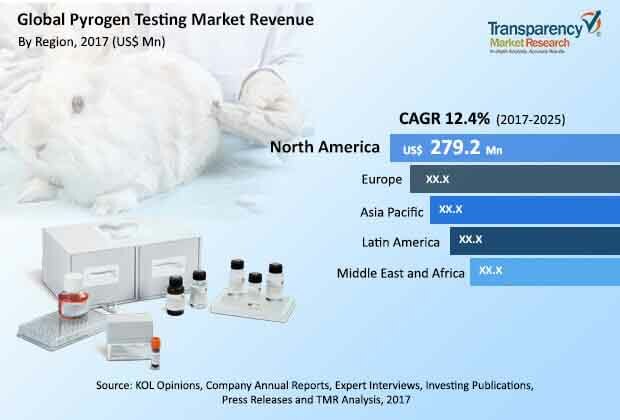 The global pyrogen testing market was valued at US$ 638.2 Mn in 2016 and is projected to expand at a compound annual growth rate (CAGR) of 12% from 2017 to 2025 to reach US$ 1,842.8 Mn by 2025. Pyrogen is a substance that causes fever post administration of an injection. Body ache and increase in body temperature are prominent reactions caused due to injection of harmful pyrogen into the body. Pyrogen testing determines the presence of endotoxin substances. Increase in public and regulatory concerns about product safety, introduction of pyrogen test in different applications, surge in new innovative drugs, and launch of biological products are the major factors that drive the global pyrogen testing market. Increase in focus of key companies on expanding their presence in countries in Asia to meet rising demand is a trend observed in the market. Furthermore, regulations by different regulatory authorities such as the U.S. FDA are making it compulsory for every parenteral formulations to perform pyrogen test as a safety measure. Moreover, rise in government awareness initiatives for health care in the region supports the growth of the pyrogen testing market. Based on test type, the global pyrogen testing market has been segmented into recombinant factor C assay (rFC), monocyte activation test (MAT), limulus amoebocyte lysate (LAL) test, and rabbit pyrogen test (RPT). In terms of component, the market has been classified into instruments, kits, and reagents. Based on end-user, the global pyrogen testing market has been divided into pharmaceutical companies, biotechnology companies, medical device companies, food & beverage companies, and others. Limulus amoebocyte lysate (LAL) test was the major segment of the pyrogen testing market in 2016. LAL test is preferred by a majority of parenteral pharmaceuticals and medical device manufacturing companies. Adoption of these tests is gradually increasing in emerging economies such as China and India. The monocyte activation tests and recombinant factor C (rFC) assay segments are projected to grow at a rapid pace during the forecast period owing to continuous development of innovative products by major and emerging players. In terms of end-user, the pharmaceutical companies segment held the largest share of the market in 2016. The pharmaceutical industry is growing at a rapid pace owing to rising importance of these companies not only in the field of conventional research, but also in the development and production of vital biomolecules and therapeutics. Moreover, the biotechnology companies segment is expected to grow at a rapid pace owing to development of the biotechnology industry and increase in approval of biological products. Discovery and launch of new products is fueling the pharmaceutical companies and biotechnology companies segments. This, in turn, is projected to boost the global pyrogen testing market during the forecast period. The food industry segment is expected to expand at a moderate pace during the forecast period, due to rise in demand for nutrient-added food products in developed countries in Europe and North America. These factors are expected to boost the growth of the pyrogen testing market. In terms of region, the global pyrogen testing market has been segmented into major five regions: North America, Europe, Asia, Latin America, and Middle East & Africa. North America and Europe account for the major share of the global pyrogen testing market. The U.S. dominated the pyrogen testing market in North America. The market in the country is driven by well-established rules and regulations for pharmaceutical manufacturing processes and rapidly increasing penetration of monocyte activation tests. Europe was the second major market for pyrogen testing. Germany is a major market for pyrogen testing in Europe. The pyrogen testing market in Asia Pacific is growing rapidly, driven primarily by developing countries. Increase in focus of key players to expand presence in the region, large untapped population, and rise in awareness about health are projected to support the growth of the pyrogen testing market in the region. Less penetration of health care facilities and lack of availability for advanced pyrogen testing products act as restraints of the pyrogen testing market in developing and underdeveloped regions such as Latin America and Middle East & Africa. Key players profiled in the global pyrogen testing market report include Charles River Laboratories International, Inc., Hyglos GmbH, Lonza Group, Merck KGaA, Associates of Cape Cod, Inc., Genscript, Wako Chemicals, Sanquin, and WuXi PharmaTech (Cayman), Inc. These players focus on animal-free pyrogen testing, which could help replace rabbit pyrogen testing during the forecast period. This report studies the current as well as future prospects of the global pyrogen testing market. Stakeholders of this report include companies and intermediaries engaged in the manufacture, commercialization, and provision of pyrogen testing products, as well as new players planning to enter the market. This report comprises an elaborate executive summary along with a market snapshot providing overall information of various segments and sub-segments considered in the scope of the study. This section also provides the overall information and data analysis of the global pyrogen testing market with respect to the leading market segments based on test type, component, end-user, and region. Based on test type, the global pyrogen testing market has been segmented into recombinant factor C assay (rFC), monocyte activation test (MAT), limulus amoebocyte lysate (LAL) test, and rabbit pyrogen test (RPT). In terms of component, the market has been classified into instruments, kits, and reagents. Based on end-user, the global pyrogen testing market has been categorized into pharmaceutical companies, biotechnology companies, medical device companies, food & beverage companies, and others. Each of the market segments have been extensively analyzed based on the market related factors such as growth of pharmaceutical and biotechnology industries and introduction of pyrogen test in different applications. Moreover, historical year-on-year growth has been taken into consideration while estimating the market size. The market size and forecast in terms of US$ Mn for each segment have been provided for the period from 2015 to 2025. The report also provides compound annual growth rate (CAGR %) for each market segment for the forecast period from 2017 to 2025, considering 2016 as the base year. The overview section of the report explores market dynamics such as drivers, restraints, and opportunities that currently have a strong impact on the pyrogen testing market and could influence the market in the near future. Market attractiveness analysis has been provided in the market overview section in order to explain the intensity of competition in the market across different regions. The competitive scenario among different market players is evaluated through market share analysis in the competitive landscape section of the report. All these factors would help market players to take strategic decisions in order to strengthen their positions and expand their shares in the global pyrogen testing market. Geographically, the global pyrogen testing market has been segmented into five major regions: North America, Europe, Asia Pacific, Latin America, and Middle East & Africa. The market size and forecast for each of these regions have been provided for the period from 2015 to 2025, along with their respective CAGRs for the forecast period from 2017 to 2025, considering 2016 as the base year. The report also provides market size and forecast for major countries in the respective regions. A detailed qualitative analysis of factors responsible for driving and restraining market growth and future opportunities has been provided in the market overview section. This section of the report also provides market attractiveness analysis, Porter’s Five Forces Analysis, and market share analysis by key players, thereby presenting a thorough analysis of the overall competitive scenario in the global pyrogen testing market. Key players operating in the global pyrogen testing market are Charles River Laboratories International, Inc., Hyglos GmbH, Lonza Group, Merck KGaA., Associates of Cape Cod, Inc., Genscript, Wako Chemicals, Sanquin, and WuXi PharmaTech (Cayman), Inc., among others.